If one is to take a surface level look, the outer appearance of the A8 is more similar to the Galaxy S8 than to the A5. With an aluminum body, a glass front and back and an improved fingerprint sensor the modeling of the Samsung Galaxy A8 present it as a redesigned version of the S8. A 5.8” inches super AMOLED display, an 18.5:9 screen to body ratio and a 441ppi pixel density the phone can be assured to have excellent graphics. An evident upgrade is that of the selfie camera. The front-facing camera now has a dual-lens; the primary lens being 16MP with f/1.9 aperture and the second lens being an 8MP f/1.9 aperture. It also supports selective focus otherwise known as portrait mode. The video recording is set at 1080p/30fps. The rear camera supports a single 16MP lens, and the video recording is set at 1080/30fps. A much-needed upgrade is found in the Samsung Galaxy A8; the fingerprint scanner is finally fixed and positioned under the main camera on the back. It also has an extremely responsive bio-metric sensor that is always active. Samsung has kept the battery size same as the majority of its flagships. The A8 has a 3,000 mAh Li-Po battery. The phone supports fast charging which will bring the phone up to 40% from 0% in half an hour. The device features a 4GB RAM and comes in two variants; 32/64GB of internal memory. It also has a separate slot for the microSD card for expandable memory. 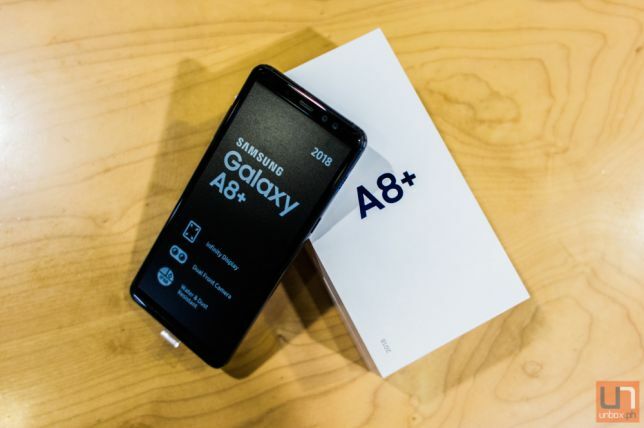 The Samsung Galaxy A8 is powered by an Exynos 7885 octa-core CPU and a Mali-G71 CPU. Although the phone is being launched in 2018, it will run on Android 7.1.1 nougat. The Samsung Galaxy A8 appears exactly like the S8 on its first look; however, the phone has a 0.2” inches smaller screen than the Galaxy S8. It also weighs 20g more than the S8 and is slightly thicker. An up-close speculation may show that the screen bezels of the A8 are slightly more than the S8, but the overall design remains pretty much the same. Similar to the 2017 J-series, the loudspeaker of the A8 is positioned on the right side of the phone, above the power button. The phone is IP68 rated for water and dust resistance. As for the price, the phone is available for $493 in the market.